I made these little favor boxes for Claire's Alice in Wonderland Par-Tea this year and wanted to share them. These are wonderful because they can be made with any 12" x 12" paper so you can match them with any party theme. 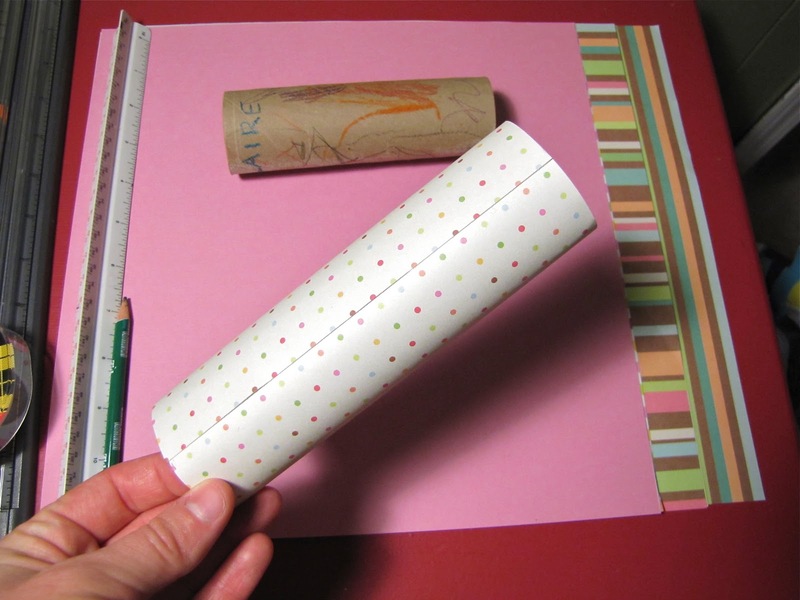 You will need 12" x 12" paper, a ruler, double sided tape, paper cutter and an empty toilet paper roll. First cut your paper in half and then in half again making 4 6"x 6" pieces. Wrap one of your pieces around the toilet paper roll. Secure it using double sided tape and pull it off the roll. Seal one of your edges closed using your double sided tape. Then fill your favor box with candy. Seal this side also only in the other direction, so it will be the opposite on the other end. Then punch a hole in the corner of your box and tie a little thank you note with ribbon. You can download the circle template here. I cut it out with my 2" scalloped circle punch. You can get that at Hobby Lobby or online here.